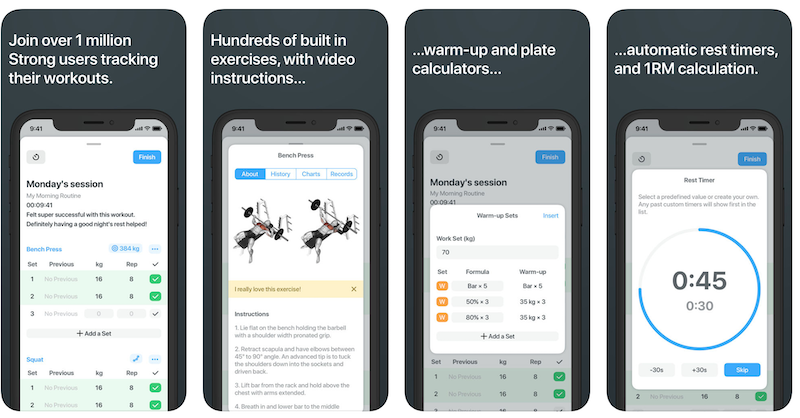 Any recommendations for a good weight lifting/work out app please? (12-23-2018 04:22 PM)jbkunt2 Wrote: Any recommendations for a good weight lifting/work out app please? 5x5 Stronglifts is good it also has a built in timer. Very simple program get in get out get strong. If you’re lifting random weights I’d recommend Seconds Pro it’s an interval timer that helps you stay focused on your workout. I have mine set for work periods and rear periods and I have different workouts with different intervals. I paid a bit over 10$ for app, probably best app investment I ever made. 4.8 out of 5 stars. 20k ratings. I bought the app years ago. Seems like they joined the subscription crap bandwagon. "The free version of Strong can save unlimited workouts, but is limited to 3 custom routines." Just to throw another option at you, JeFit is also a good one with a solid list of exercises and good logs. Most of the better ones all do the same thing so really it's just about grabbing one with an interface you like and going with it. Something I think it will make the training better is to get an Apple Watch. Having to remove the phone from your pocket after every set so I can put the corresponding weight number is bothersome, specially when I'm listening to music. I use an iPhone SE. Can't imagine training with those monster phones. So in my wish list are: an Apple Watch and those wireless headphones (AirPods). The best motivation is to have pretty girls in the gym though. I usually just use a pen and small paper notebook to track my lifts, I guess like some sort of oldskool weirdo. That Strong app looks cool though, might be worth making a leap into the 21st century for. I won't get into what program is the best since there's so many great options and that's up to you, but I've been using the 5 3 1 app (the icon is a red circle) and being really lazy and not wanting to calculate things it makes following the plan really easy because it gives you new weights for each workout and you just click a button when you finish a set and put your reps in if you did more. (12-25-2018 07:09 AM)joost Wrote: Something I think it will make the training better is to get an Apple Watch. Having to remove the phone from your pocket after every set so I can put the corresponding weight number is bothersome, specially when I'm listening to music. I use an iPhone SE. Can't imagine training with those monster phones. Unless you're going to use it for a lot of other things then you're better off saving yourself a truckload of cash and just getting one of the Garmin/Fitbit/Etc type fitness tracking watches that are better designed to handle workouts anyway. Ditto for the headphones, grab a good set of the fitness ones that are designed for working out (sweat-proof et al) that cost half as much as the airpods and are better headphones anyway. You can get the previous generation of Bose ones for less than $100, the set I've had is going on 18 months now of pretty solid usage with no issues. Ton of other brands make them just as well for less as well. I'll second the 5x5 strong lifts app, great for beginners. (12-25-2018 07:22 AM)zatara Wrote: I usually just use a pen and small paper notebook to track my lifts, I guess like some sort of oldskool weirdo. That Strong app looks cool though, might be worth making a leap into the 21st century for. Apps I also used and liked: Jefit & Stronglifts!